Traxx Mobility Solutions TITAN 500 – a freestanding overhead patient lift for home care. Home Care is increasingly the ideal long term care solution for many older adults, including those suffering from chronic illness and mobility issues. The Traxx Mobility Systems TITAN 500 Patient Lifting System improves the quality of life for individuals with limited mobility and their caregivers. The TITAN 500 is safe, reliable, and extremely affordable. Due to its unique design, caregivers can lift and transfer their loved ones from bed to wheelchair and back again with ease, comfort and security without the physical strains of manual lifting. When it comes to individual care within the household, a bedroom is most often chosen as the primary care setting. Average room size is limited, usually less than 12′ by 12′ in total. With a bed and multiple pieces of furniture, the amount of space need to properly maneuver the standard manual floor lift is extremely limited at best. Easily installed in any room in just minutes, the TITAN 500 is freestanding, battery operated and easy to operate. The freestanding frame is made of strong, durable aluminum and can support up to 500 lbs. The lift motor is battery powered,easily recharged and runs for days after a power loss. The ergonomic sling design combines strategically placed padding and adjustable strap attachment to a four point lift bar ensuring a stable, secure and comfortable experience while being lifted or transferred. The Traxx Patient Lift is freestanding; there is no need to attach to walls or ceilings and installs in minutes. 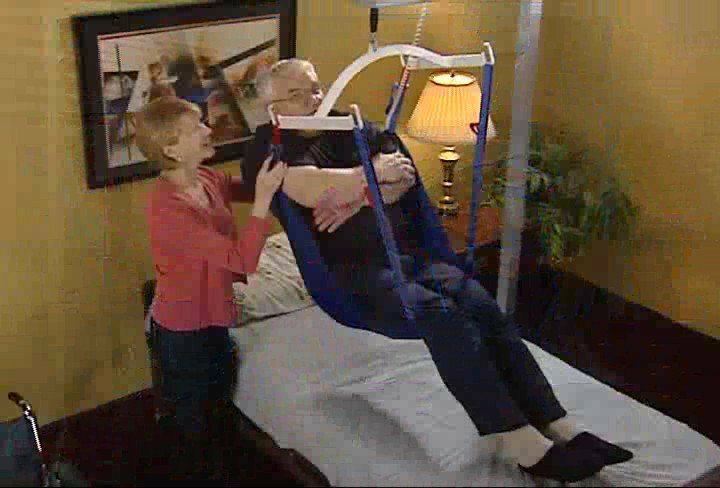 Lifting your loved one is as easy as one touch with the Traxx Mobility Systems TITAN 500. For more information on the Traxx Mobility Systems TITAN 500, visit our website, find us on Facebook or watch our YouTube channel.